English has gained virtually sole status as the shared language of trade and commerce in day-to-day business across the globe. Which is why getting your message just right in a language that is not your own is paramount. Adding that very English idiom style phrasing is pivotal when it comes to putting your message across. The effort that goes into priming your goods and services, ready to be marketed, is well worth professional expertise during that final stage. For those instances, it is good to know that you can rely on the services of an English native speaker. 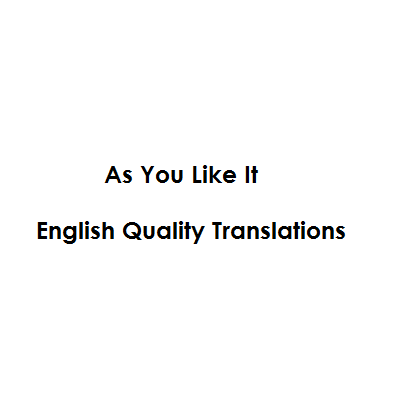 As You Like It – English Quality Translations is one man giving your text the full attention to detail it deserves – in letter and in spirit – not just translating blindly. With a track record of 26 years’ experience as a professional sworn translator and interpreter, As You Like It handles all of the following and more: legal, financial and insurance documents, business presentations, reports and business correspondence, litigation documents, court rulings, academic papers, technical documents, websites, books, magazines, newspaper articles, etc.